Sian Davey is a photographer of who centres her work around her family, and the environment surrounding her. I found her body of work, titled ‘Looking For Alice’ and her ongoing project titled “Martha’, both based upon her children, to be intimate and nostalgic. 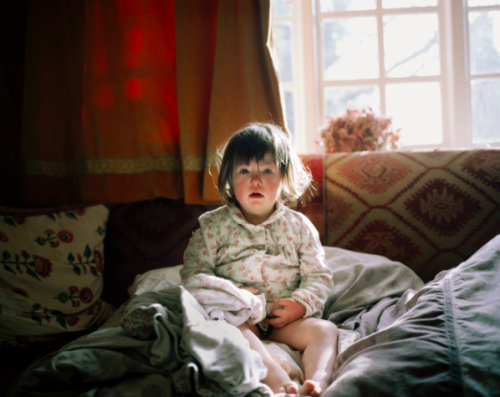 Throughout ‘Looking For Alice’, Sian documents the unique experiences of her youngest daughter’s life, living with and growing up with Down Syndrome. Her work, is emotive and this I feel is evidenced in the way she chooses to photograph her daughter. This body of work was shot using a medium format camera and Kodak Portra film; the conscious decision to use colour as opposed to black and white was very deliberate and really adds sentimental value. Davey’s eye for colour and light compliments the series greatly, paired with the use of medium format. The majority of Davey’s images are of a medium format frame with the subject in the dead centre of the image or strategically placed on one of the compositional intersections.